What a great few weeks it has been low flows at night has created ample fishing opportunities, and as you all know Night Time Is The Right Time. We have been floating a lot and with my real gig, I have not had time to post anything. 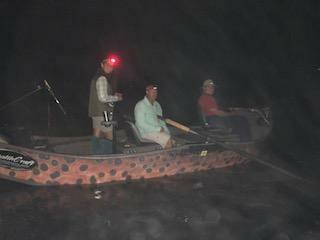 So this a report covers about 3 or so weeks of fishing the White at least once or twice a week, we have been launching the boats around dark and fishing it hard for about 4-5 hours. I don't have any place to stay so I have been just turning and burning so I am home in time to get my daughters to school. We have been chunking mice and big streamers when the fish won't eat on top we go down below and feed them. For the most part water has been between 7mw and 35mw, I feel the fishing is better between 35 and 50mw though. 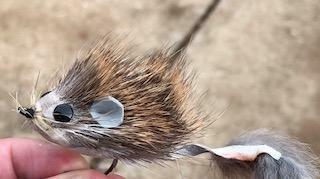 Just swing and strip it in and boom they will tell you when they are ready to eat, also on the mouse when they come up and miss it just let the fly sit don't move it the fish is still there around it do a couple of small strips and usually they will attack it again but this time they will connect. Some nights we are catching a lot of fish and some nights we don't catch very many worst night I have had so far is 1 fish best night is 13. You might be saying that's not very many either way, however they are all Browns and most nights they are all over 20 inches. 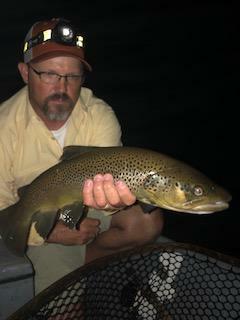 To me fishing for Browns at night is the only way to go as that is when they are doing there thing and feeding most big fish are nocturnal and only will feed at night. When fishing the mouse it is very important to cast it out as far as you can the further the better off you are I will tend to have a sore shoulder the next day as I am trying to carry as much line as possible 70-80 feet every cast on a 7 wt. I am using floating line along with about 10 foot of straight 20 pound Seagar fluorocarbon. 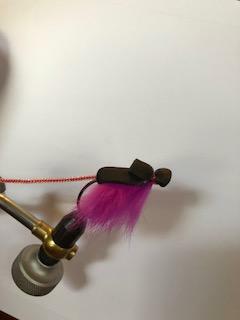 Let it swing in the current and then when it is straight start stripping 90% of the time when the fish hits it will be at the end of the swing. However that other 10% will follow it right up to the boat and attack it within 15 foot of the boat. 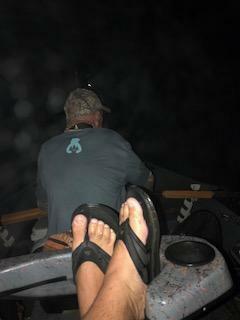 There is some truth to my statement that "Night Time is the Right Time" the river it self is not getting hammered by boats or fisherman most nights either on Taney or the White we are the only boats on the water, which will lead to some great fishing. 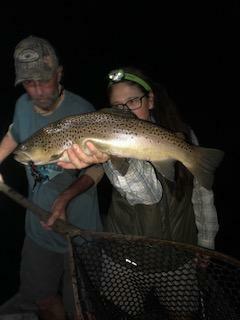 Most nights all we only catch are Browns and good quality healthy fish ones that like to fight and are full of energy. I Don't ever worry about the moon phases never have never will, as I just fish when I can but I will say that lately the new moon phase and the dark nights when the moon is up during the day have produced some of the best nights. The cool thing about the night time mouse bite is that you can actually here and see the fish most of the time eating it. There is one spot on the river that there is enough ambient light pitched in with the full moon that you can actually see the fish charging forward after the mouse, it looks like a baby shark coming after it, pretty cool if you have ever witnessed it you know what I am talking about. 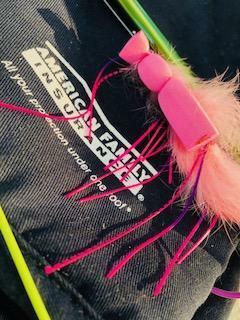 As far as streamer fishing we have been using a few articulated flies Kelly Gallup's Fat Head and Tommy Lynch's Drunk and Disorderly have proven to be the top fish catchers. when we fish these again we are fishing 7 to 8wt rods with floating lines if the flows are right and I am still just using straight fluorocarbon 15- 20 pound test. If the water is up say 2 units I will use a full sink line type 4 or 5 just depends on the flows on what I will use. the last few weeks it has been a floating line kind of nights. We have caught several good fish over the last 2-3 weeks on the White and if you want to catch a good numbers of Browns in one night you need to go down and do it. 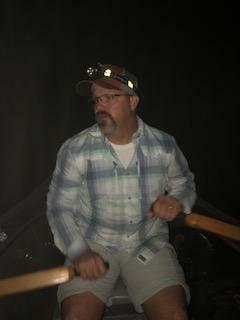 I sold my drift boat 6 years ago so I am blessed to have good friends at Fly's & Guides and Straight Out Of Cotter that have helped me make it back to the river floating at night if you want to go you should give them a call and they would be more than happy to row you down the river to catch a big brown at night. 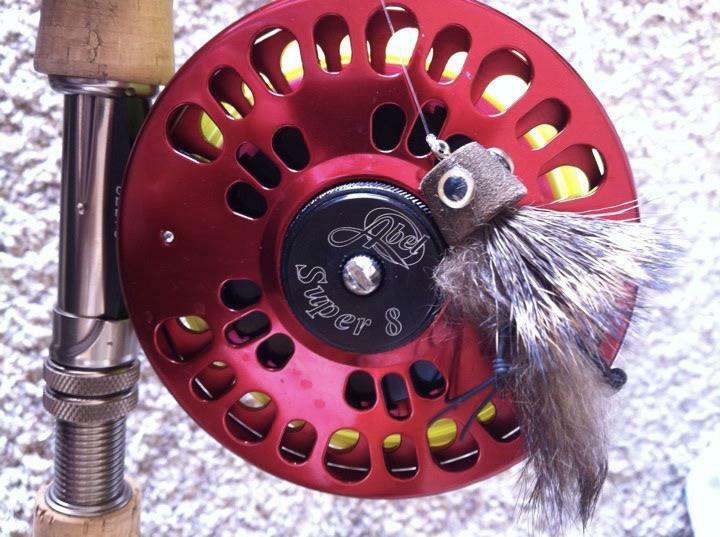 Lots of stuff to talk about and I have ran out of time to type any more so hope you enjoy this read and till next time look me up on face book at "Up Sauce Creek Fly Fishing & Custom Flies".